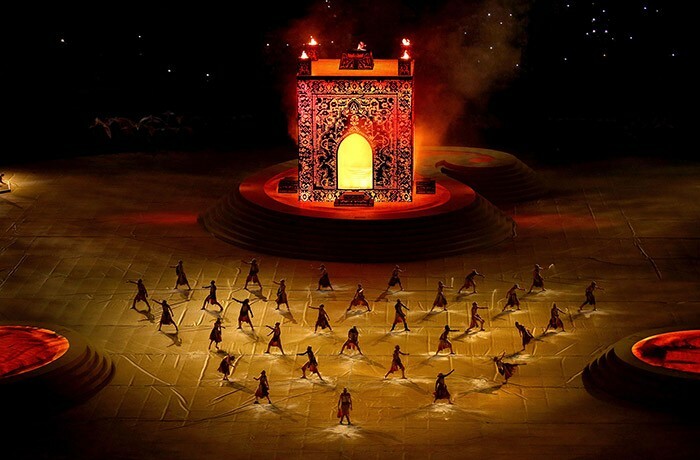 Audiences were left enthralled and entranced by two dazzling Opening and Closing Ceremonies staged in the National Stadium in Baku, Azerbaijan for the first European Games, which saw Belgium-based engineering specialist WIcreations involved in making some key elements of these innovative and beautiful shows come alive. WIcreations was approached directly by California based production company FiveCurrents who produced the Ceremonies. WI’s team was led by Yves Vervloet and worked closely with FiveCurrents’ Senior Technical Director Nick Eltis. The Heist Opt den Burg-based company was tasked with helping create some major visual moments, including the magic flying carpet during the Opening Ceremony, and design and construction of three performer stages for the Closing Ceremony, complete with a Temple of Fire rising up from beneath the largest one. One of the Opening Ceremony artistic directors Dimitris Papaioannou was inspired by the Azerbaijani tradition of carpet-making for a section of the show, so a magic carpet – complete with famous Azerbaijani performer perched on top – was among the major 'wow factors' of the show. WI proposed the best solution to create a realistic waving movement for the carpet as it sped through the air from the back of the stadium to the front of the Prodigal Stage where all the competing country flags were being flown. The movement was achieved by designing and building a 12cm high aluminium frame fitted with 42 moving arms – 21 per side – on a crank-shaft system powered via a battery controlled DC servo motor, which sat underneath the cloth carpet and produced highly authentic flying carpet wave-like movement whilst whizzing on its journey! The four metre long by 2.5 metre wide carpet, complete with wave frame, weighed under 200kg and was picked up via four 4mm steel wire cables and attached to a flying system engineered by TAIT. The actual pattern on which this carpet was based is displayed in the Azerbaijan Carpet Museum and is from the family of current President Ilham Aliyev, so it was therefore vital that the flying version was perfectly replicated. Weaving it from scratch was not practical and would have also been too heavy, so WI sourced an expert cloth printer in Belgium. Finishing the borders and the tassels were the most challenging and protracted part of this exercise, completed by hand by a master carpet-maker. Underneath the top layer of carpet was a poly-stretch construction in the middle to provide the area on which the performer could sit comfortably and safely. Thousands of cast members dressed in multi-coloured costumes were also used to create vivid geometric shapes on the circular field of play in the centre stadium. 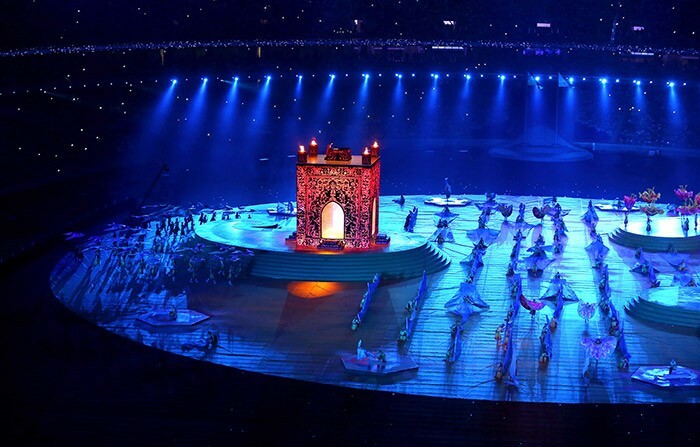 For the Closing Ceremony, the WI team build three tear drop shaped performer stages, each covered in a video floor supplied by CT. 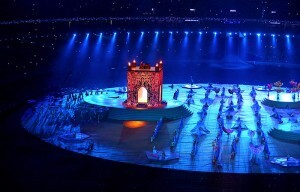 The largest was two metres high and equipped with a specially designed lifting system which allowed the Temple of Fire – a realistic scenic version of the castle-like religious temple in the Surakhani suburb of Baku – to rise up to ten metres in the air, complete with performer on top during a section of the highly emotive, breath-taking finale. Using some of that powerful and inventive ‘Wimagic’, Yves explains how they developed four telescopic lifting systems, one in each corner of the temple, connected to trusses and with a lifting cap of eight metres and an inner height of 1.65 metres. The movement of the Spiralift motors raising the towers was so smooth and organic that it resembled grass growing in real-time, in the process creating some serious goose-bump moments for technical crew and audience alike. The lifting was controlled via a Kinesys Vector system, and the four temple towers were made from double-layered fabric designed by WI in collaboration with soft goods specialist Showtex. Each tower had remote controlled flames bursting out. WI managed to design and fit the lifting system into the stage with only 2mm gaps to spare at the edges, enabling it to be completely concealed. Anyone watching from the higher levels of the nearly 70,000 capacity stadium or looking at the overhead camera shots on TV and admiring the stunning images shooting across the video floors would have absolutely no idea that anything would start rising out of the stage. The WI team was delighted to be involved in the opening and closing ceremonies of this first European Games, which have won much acclaim for their eye-catching vibrancy, fantastic choreography and all-encompassing entertainment value, also helping establish Azerbaijan as a contender for future world class sporting events.